What does one do with a pump that has 447 kW (600 hp) and pressures to 40,000 psi? Why, whatever one wants. 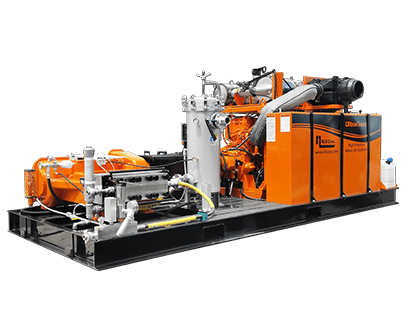 The 605 Series diesel-powered units are the 800 pound gorillas of the water blasting world. With power and flexibility to spare, if your application can’t be tackled by one of these units, it can’t be tackled at all. Models are available ranging in horsepower from 354-447 kW (475 to 600 hp) and with pressure from 275-2 800 bar (4 000 to 40 000 psi). These units are all built around the 605 convertible pump. This pump, with its quick-change, in-line fluid end design, has fewer parts for increased operating efficiency and simpler maintenance. And, it requires only a simple conversion kit to operate at pressures between 275 and 2 800 bar (4 000 and 40 000 psi). The NLB 605 Series units are built to the exacting standards that have made NLB equipment the contractors choice for over 40 years. All operating controls, including the pressure compensating by-pass valve and pressure gauge with snubber, are mounted on a separate accessory manifold, which provides additional protection for these important components.